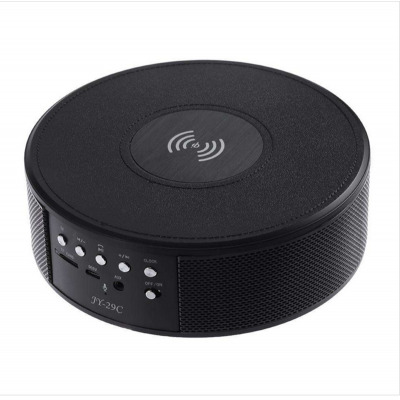 Successfully Added Wireless Bluetooth Speaker - Wireless Charger, NFC, TF Card Slot, FM, AUX In, Clock Alarm, Built-in Microphone (Black) to your Shopping Cart. This Bluetooth speaker is a multi-functional digital device combined with wireless charge, clock control, Bluetooth, TF, FM, AUX all in one. With double speaker and bass it will have powerful sound. Friendly operation screen with clear silk print tips, it will be very easy to control. Bluetooth module can be compatible to mobile phone, computer and most of the Bluetooth set devices. Charging easily and saving time as well as energy so that charging mobile phone has never been so convenient. Simply put the mobile phone above the speaker connected with power supply can be easily charged. No need to use USB cable to charge, the charging process is more convenient and sample. This is a fashionable, uniquely designed multi-functional digital MINI Bluetooth speaker.It will offer you excellent sound whiling travelling, business working at anytime. If you use the Bluetooth speaker for a long time, please turn the volume into minimum of taking or listening of the music that you need.